To Be or Not to Be…THE BOSS. 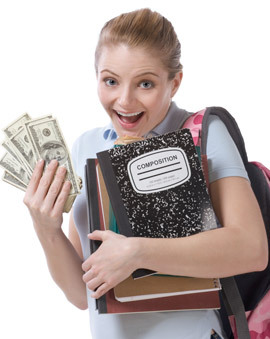 Flex Your Entrepreneurial Muscles and Make Money in School! With a little ingenuity and some elbow grease, you could start your own business—and make some extra cash—without having to leave the classroom. Happy B-day: Run a custom-designed locker decoration service for students’ birthdays. Hallmark, Shmallmark: Create and sell original cartoon birthday or special occasion cards. Have Henna, Will Travel: Install a henna painting booth at outdoor school functions or even during lunch hour. Surfing for Cash: Design web pages for students, teachers or various school teams/groups. Scanning Opportunity: Make a digital version of the school yearbook (current and past) by scanning the pictures. Say “Cheese”: Snap some school pictures from September to December and create a picture calendar on sale in January. Action! : Record school events on video (e.g. sports and plays) and sell edited copies to students, teachers and parents. Expert Hair-Braider for Hire: Offer your services to do French braids, corn rows, etc…before big school events (e.g. dances and prom). No Task Too Long or Too Short: If you have a knack with sewing machines, offer to do hems, darts or even turn those nasty cords into a cool hippie cargo skirt. Get Dirty: If you know how to do an oil change (and have a space where this can be done! ), recommend your services to students and teachers. Being your own boss can be great. On the other hand, having to fire yourself or go out of business when things go bad would really be a drag. • Is there a need for my product or service? • How much will it cost me to start this business? • How much can I realistically expect people to pay for my product or service? • Will I be able to make a profit? Remember, not all teachers or principals are keen on having you run a personal business in their school. Check it out with them before you invest the money for your start-up materials!